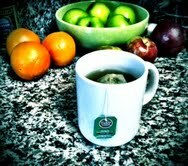 Mmm...I love Chai Tea. 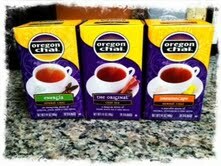 Oregon Chai is the chai tea of all chai teas! They graciously sent me three different types of chai tea to try: the Original, the Energia herbal chai, and Dreamscape herbal chai. Each box comes with 20 bags of pure bliss. There are so many different ways to enjoy your chai. I enjoy it heated with or without a little bit of sugar and cream. I also enjoy it cold, brewed and poured over ice for a refreshing treat. Chai has always been regarded as a healthy alternative to coffee, with a lower level of caffeine (although the Dreamscape is naturally caffeine free) and has been known to improve one's vitality, mental clarity, and calming- all at the same time! Not to mention, it tastes incredible. These three different blends of chai are fitting for whatever mood you are in. I obviously cannot pick a favorite, because I adore all three blends. So, you're ready to try it, right? Thanks to Oregon Chai, we have my first birthday week giveaway! One lucky winner will receive a box of each Oregon Chai flavor above: The Original, The Energia Herbal Chai, and The Dreamscape Herbal Chai. Good Luck!! I like hot The Original chai. Hot and as is for me, no sugar or creamer! Definitely hot- 3/4 chai and 1/4 soy milk. I like to my chai with almond milk and honey! I love the Oregon Chai blend plain, and staming hot.